The truth is, I didn't have that much time to play, and I desperately wanted to test different decks, so I created more accounts and was buying different packs and boxes, so even if I have the same starting faction, I am playing it differently. Now when I have a bit more time, I am playing on those two accounts, since I have the best cards there and I am farming with them. You can see by my last few posts that I got pretty lucky with the Herald of the Void Box, so I have even more options now. Thanks all for the nice response,. I hope sometime we can have a nice meet in DoC,. By the way, so many people play with Necropolis Starter Deck,. i'm really curious about what things many people consider to choose that,. personally my deck is Necropolis too,. In many duel i fought yesterday,. i found many people i engage in duel mostly use Necropolis, a lot of Inferno and some people use Haven though, if i may know a little what deck are you choose first for playing Doc guys? and what deck are you playing most until now? sorry for little bit off topic,. but i'm really curious about that,. Btw,. my ID is AndyIshida,. feel free to add me if would like to do it,. I would start with Inferno Xorm deck, as you'll have fast battles to level up quicker, gaining ELO faster, and thus extra cards faster. I got to 1000 ELO in less than a week. It depends. Most people consider Necro to be "overpowered" so they choose them to start with. In the beginning the faction is not as important as getting the right cards. Last time I started over, I got to ELO 1000 in two days and a half using a naga deck (I used the gold for Starter packs and the seals from the campaigns for Void Rising boxes ultimately searching for Blackskull Vulture Riders). Now I'm buying Starter decks for gold, Void Rising boxes for seals and I'm winning Herald of the Void packs from the Swiss tournaments working simultaneously on three decks - Kelthor enrage, Fleshbane fortune/control with Banshees and spiders and Inferno with Dhamiria. Necro players can also get Ariana's deck early which can give them a pretty good start. Edited by Dave_Jame at 17:58, 10 Jul 2013. Guys, new redeem code from DoC facebook page. It gives you Herald of the Void pack. Thanks a lot for the nice reply to my post,. now i can understand several reason why people choose one faction or people more favor a right card than a specific faction,. because of all your opinion guys i know about this little but useful knowledge,. thanks for all,. seems you all can get high rating fast enough though,.. nice play...! is that important to buy a severed fate deck for my starter necropolis set,. in your opinion guys? Once you have a solid core of cards, I recommend buying Emilios, they rock! @Andy: Not important per se, it's just an option. That is after a few hundred packs Seriously, while Emilio can get you some good stuff, you have abysmally low odds to get the cards you want. That would not be a problem if not for their price but any new to intermediate player is better off buying more packs with reliable cards(reinforcements and heroic especially, void is too expensive atm) than fewer with unreliable ones - even if they may have herald cards. Now if your base set is almost complete and you are missing many void cards, Emilio looks more tempting. posted July 19, 2013 01:26 PM bonus applied by VOKIALBG on 22 Jul 2013. Some stats I worked out. For every reinforcement, void rising, or herald pack, it shows the probability of getting a certain card. For example, if you are looking for an Epic Fortune card in the base set from reinforcement pack, the probability is 0.7%! I recall that getting an epic is 1/7 packs. Edited by Dave_Jame at 16:55, 19 Jul 2013. I have taken them into account. It's all calculated in my little excel spreadsheet! 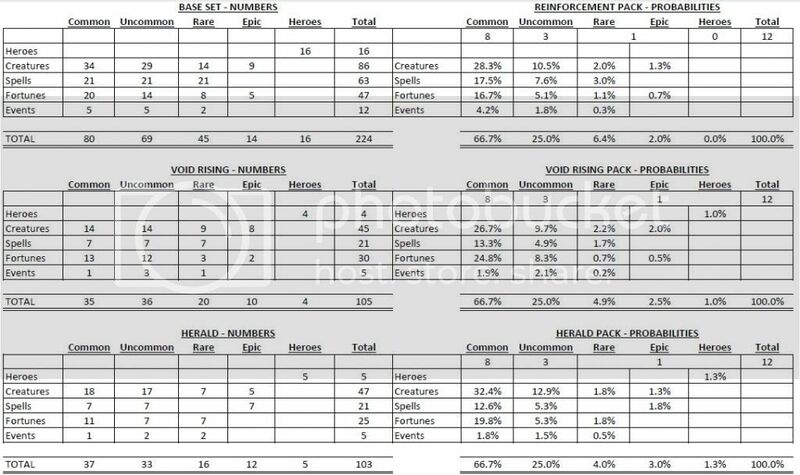 Look at the just below the Probabilities headings, you will see 8 common, 3 uncommon, and then shared 1 rare/epic & hero sometimes. There are 7 epic spells in Herald. There are (16 rare + 12 epic + 5 hero) 33 cards in total in Herald. You get 1 rare/epic/hero card in a pack from Herald (out of 12). ( 7 / 33 ) * ( 1 / 12 ) = 1.8% chance of getting a epic spell card. Edited by Dave_Jame at 00:30, 20 Jul 2013. In this case I disagree with your logic.. you base it on the number of cards in a pack. but in a pack you have a 100% chace to get a hero/rare/epic. One, and only one, of these cards will be in it. So the number of commnon and uncommon has no influence on the rare cards. from your data there are for example 59 rare and epic cards in the base set. When you buy a pack.. any pack.. you have a chance of 1 to 59 to get a specific card.. well its not that easy since epic cards have a lower chance but the general idea is, that you can't say a card has 1,8 chance of droping and put it in a pool with cards from a different groupe. the 1/12 part in your equation is totaly useless IMHO since in a pack, the number of Rare and epic is always 1 never more or les. It wood be good to know the official probabilities for hero/epic/rare cards. Since they only take 1 spot in the booster and are roughly one third of the total card pool, i think everyone will be swimming in un-commons and commons way before he manages to collect the latter 3. In vanilla game i recall hearing about epics being 6 times less frequent than rares. So in 7 packs you would on average get 1 epic and 6 rares. But now that Heroes share the same slot in the booster, i wonder what the ratio of them is at. Here are the numbers that i have (filtering collection by rare/epic/hero in both expansions). Now, since we know that herald has the most epics per total pool, the grind to catch all the Orange Pokemon has become even more insane than before :S.
I guess my wording is incorrect. It's not the probability of a card appearing, it's the representation of each pack of a certain card. Therefore, if we take the base set, total rare cards (6.4%) plus total epic cards (2.0%) we get to the 8.4% rounding applied here. So it's a snapshot per pack of the representation of each type of card. AWESOME, thanks! +QP for the man!